As we now know when gladiators fought in the amphitheaters they were matched or paired up against other specific gladiators. For example it was common for eques gladiators to only battle other eques, because of the fact they started battle on horseback. It was also common for the retarius to only face the secutor, although sometimes the retarius might battle a murmillo. So while in our individual articles on each gladiator we mention which other gladiators they fought, this will make it easy to view all the common gladiator pairings and matchups in one area. Two eques gladiators are the pairing here, as they fight on foot. The following are thought to be other matches between gladiators, that fall outside of the typical gladiator and confirmed classes. In many sports, the goal of winning is often based off individual skill, which means in order for a sport to be fair everything needs to be equal. This was also true in some gladiator matchups, but not in all of them, therefore our goal here is to highlight the various reasons between the common gladiator matchups of Rome. The classic match up of retarius and the secutor. 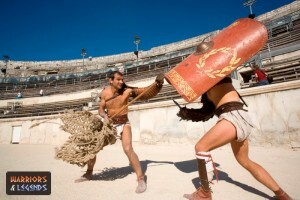 Matches where the gladiator fight would be won based on skill alone were when the gladiators were evenly equipped. For example with the eques battles they would only fight other eques. This was where the opponents had very different sets of weapons, or essentially what you would call contrasting weapon sets. These gladiator battles have deeper meanings behind them, whether it is the battle of a fisherman trying to catch food, or the recreation of a battle between the Greeks and the Romans. 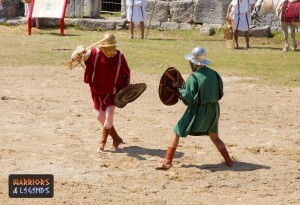 These style of matchups were very common in the Roman gladiator battles and also served the purpose or re-enforcing the common enemies, and historical enemies of Rome. The battles between the * and the * as we mentioned represented the battles between Greece and Rome, and would serve as a timely reminder to all of the wider society issues at play, while offering up some great entertainment for the Roman citizens. There were various matchups that were seemingly for entertainment more than competition, with gladiators fighing against noxxi gladiators(prisoners or slaves not typically worthy to be a true gladiator) and in these matches it was expected for the noxxi gladiators to lose. Here are some examples of this type of matchup. 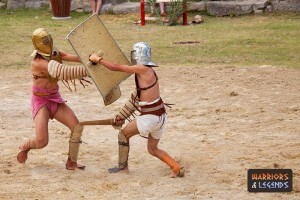 The gladiator pairing of two provocator gladiators fighting. As in many areas of Roman life, the government and rules of Rome were very adept at looking for ways to keep their society in order. The gladiator games were very much an extension of this and many of the matchups were great at solidifying that social re-enforcement. Who is our enemy, who were our enemies, or in the case of the higher orders of Rome like the eques that life was fair and equal.